Happy Friday! This week I'm in H-town for the nuptials of one of my most favorite high school pals. I love her and the wedding is going to SO freaking fun! Congrats to the pretty lady and the happy groom! I can't wait to party like its 1999 tomorrow! 1. 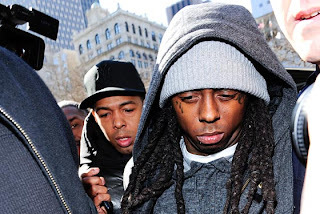 Monday, Lil Wayne actually went to jail. There has been lots of dilly dally surrounding him beginning his jail term for weapons possession. His original hearing and date to head to Riker's Island prison was Feb. 9. On that day, he got an extension until March 2 to get some "dental work" taken care of. What? I assume this relates to his blingy grill. Then on March 2, he got another extra week because of a "mysterious courthouse fire." He is one lucky little ducky, or perhaps he's found legal loopholes in the past, but I can't imagine that. The amazing thing if it all is that he's been pouring out recordings and videos in his extra days. He's filmed over 15 videos! His handlers intend for his fans to not ever feel deprived of Weezy goodness. We'll see about that. He could get out of there in as soon as 8 months with good behavior. I wonder who his cellmate is going to be? What in the world will they talk about? 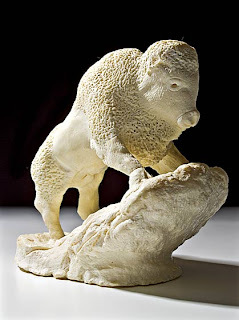 I hope he learns some freakish craft on the inside, like making buffalo soap sculptures (I read something about prison art a few weeks ago and this one blew my mind): 2.Corey Haim died. I'm too you ng to know any of his real works, just that he was addicted to various drugs and was a perpetual relapser. 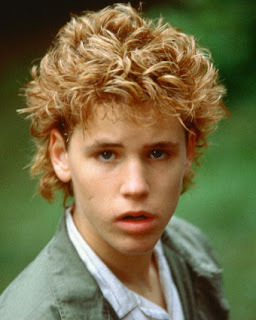 It breaks my heart that he was more famous amongst younger groups for his stints on reality shows as the "effed up guy from the 80's." After decades of famously being addicted, his loved ones are asking that we not jump to conclusions and wait for the coroner's report. That's what they said about Brittany Murphy, Michael Jackson and sweet Heath Ledger. Give me a break. Nonetheless, it's no less tragic. I don't think this is anything like when Elvis went to the Army. The Army is a selfless act of patriotism. He's going to jail for guns....does Bun B even really know who Elvis is? Isn't that the truth? I like this Gaborey. I like when people aren't famous enough yet to have people tell them not to say stuff like this. 5. Kate Middleton's (the possible future queen of England) cocker spaniel, Otto, ate some earrings gifted to her by the beautiful Prince William. The pup stole them off of her nightstand. She then was forced to reclaim the antique pearls by walking him several times a day and searching through his excrement for them. She did in fact recover the baubles, but they were damaged beyond repair. Obviously her perfect boyfriend replaced them. Future Queens - THEY'RE JUST LIKE US! This gives me, and hopefully all queen-of-England hopefuls who have spent some time looking for valuables in puppy poop, hope. Tai: Cher, you're a virgin? Cher: You say that like it's a bad thing. Dionne: Besides, the PC term is "Hymenally challenged". 7. The official Eclipse trailer has been released. I've waited for weeks. Thanks for playing, have a Happy Weekend! Interesting point on the Chile flag. Did you know it is called "la estrella solitaria?" For those of us who don't habla espanol, that's Spanish for "the lone star." And Chili is pretty much the national dish of Texas. Weird. But apparently the Chile flag is about 20 years older than the Texas flag (which is about how long it took from news to travel from Chile to Texas before the Internet). That made me feel wierd. It was sort of like looking in a mirror...sort of.